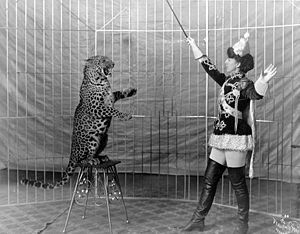 When people watch an animal trainer work it is normal for them to focus on the end result rather than the training process. We’re not taught animal training in school except on a very abstract level, maybe in psychology class, so most humans can watch an entire training session without understanding what they are really seeing. We get so caught up in the transformation from untouched to under saddle in the horse, or the calm of the trainer in the face of flying hooves that we don’t notice what the trainer is doing to get behavior change. We’re often impressed with a trainer’s bravery in the face of possible physical harm – so impressed that we value the trainer just for the spectacle and drama of their work. But when we identify just with the human component of the equation or the spectacle, we can forget to check in and see if the animal is happy and relaxed. We can forget the animal has valid feelings too and didn’t choose to be trained. The way a trainer achieves behavior change matters, especially if we put ourselves in the animal’s place. We now know animals experience emotion much the same as humans do. We are wholly responsible for the emotions we elicit in our horses through training. To me, a trainer’s oath should be the same as a physician: First, do no harm: physically or emotionally. How would you feel? Would you feel like the humans in this video were trying to actively gain your trust? Your loyalty? Do you think this looks like a method that avoids punishment? Can fear or confusion be just as punishing as pain? How would you feel as this young horse? Would this feel like a positive experience to you? Does the pen seem to offer freedom or restriction? How would you feel having a rope continually tossed at you? How would you feel being allowed to run off but made to run farther and faster for your caution as a flight animal? How would you feel as this young horse? Does he look trusting already? Does he look ready to be ridden? How stressed does he look once his owner/trainer gets on his back? Does this look like a positive experience? If I had one gift I could give horse owners, it would be to learn to watch training sessions with a good critical eye. If a trainer uses a method you aren’t familiar with, observe what they are doing to the animal and imagine how it would make you feel in their place. If that is hard for you, ask a friend to “train” you the same way you observed. That will clarify VERY fast how you feel about the method. It sounds funny but you’ll be amazed at the different emotions you feel as long as you take it seriously. You don’t have to be an experienced trainer to know if certain training methods utilize discomfort, fear or threat to achieve results. If we suspend our human-ness for a moment and imagine ourselves as the animals in these videos it’s easy to make decisions about how we would like to be treated. All animals, humans included, enjoy choice, rewards and low stress learning environments. The emotions an animal feels while being trained aren’t just fleeting things that disappear like smoke once the training session is over. They get attached to certain predictors like the sight of the trainer, the equipment used or the space used for training. This is Pavlovian conditioning and it happens whether we want it to or not. While you train your horse in what to do you are also training your horse how to feel. So learn to watch a training session not just for the results but for the emotion it brings up in the horse. This entry was posted in colt starting, horse clicker training, horse gentling, horse starting, horse training, positive reinforcement and tagged classical conditioning, clicker training, colt starting, horse gentling, horse training, Monty Roberts, natural horsemanship, negative reinforcement, Oscar Scarpati, Pavlovian conditioning. Bookmark the permalink. That’s ok! That makes me nuts too. I wish the clips would e-mail. Thanks, Jen. One of those doma vids was posted on a wildhorse training group. When I commented that I could not watch it I was told how valuable it could be. When I watch a trainer , look into the horses eyes, and it gives me that sick feeling in my stomach that is not what I want to do to MY horse. The last video is how I want my horse to feel about the things we do together. Hear, hear, Sandra! I couldn’t watch that whole clip either and I didn’t bother to watch Monte, I’m already familiar with his work. Once you know what to look for, the rest just becomes so much garbage. Yes, that’s where I originally saw the video. People get SO caught up in the spectacle, or the age and reputation of the tradition, or the different details of the work because of the cultural differences that the animal becomes invisible. No matter what country, what trainer, what method all you need to do is ask the question, “How would I feel if that happened to me?” It’s so simple that it’s hard. To be fair, Oscar is MUCH gentler than most of his fellow “horse-breakers” but it’s still pretty rough stuff. I was at a wildhorse training workshop in Utah a number of years ago. John Sharp and I were talking one morning. I commented that the dust in the arena was horrible. He looked at me and said “imagine what it’s like for the horses”. I knew right then that he was a true horseman. That is what I try to do with any animal I work with. wonderful comparisons..and yes of course the last one is what i want..well done..as usual..when will these guys figure it out? @ Sandra: Yes, “imagine what it’s like for the horses”, indeed! Lovely. @ Monty: Thanks! Not hoping for any of the big names to have epiphanies, just for everyone up and coming to learn to look at work with a critical eye. Thanks, Peggy. You were aware enough to look at both the behavior and the emotional state of the horses, which I think is unusual. It’s weird. I’ve found that people who have no horse experience have no trouble identifying stressful training techniques but those of us who have been raised around horses have to re-learn how to see. Can’t wait to meet you in April! Must have been something wrong with the trainers, Madeleine. We had almost 50 horses at the workshop, fresh off the range. Only one who was so frightened she couldn’t be still when people were around needed some extra help. Donna West knew just what to do for her. Yes, I like Klaus. He is exquisitely body aware and really uses the least amount of pressure he has to to get a behavior. I wouldn’t mind being one of his horses. I’ve been trying to figure out how to use his methods and philosophy in my work with dogs. So far fairly successful, but still having to figure out the “dance” moves with an aggressive dog. Shy dogs were easy. I’d love to see some video of what you are doing, Jamie! Have you done any of Grisha Stewart’s BAT work? There’s a lot of work with thresholds, teaching disengagement and moving away – definitely an elegant and effective “dance” and wonderfully effective with aggression. I have all Grisha’s books and have read them and watched the video’s. I don’t use BAT itself, but I do use a lot of the concepts. And yes, I have video’s on my youtube channel of what I’m trying to figure out. I call it play training, but it’s more like game training similar to Susan Garrett of agility fame. Play is such a basic for most animals, and it has so many uses. My channel is http://www.youtube.com/user/walkme0962?feature=mhee. I’m currently writting a book on the successes I’ve had so far. I use play to teach, to distract, to reinforce and for stress relief. You’ll see each in the videos. Very nice article. I am so pleased to see the third video, starring a good friend of mine, she’s an amazing trainer. This is an interesting article but hardly a fair comparison. The clicker trained horse had already been started under saddle before his present owner purchased him and started to use clicker. What we are seeing here are horses at very different stages of their development. I am a proponent of the use of positive reinforcement but I think it is disingenuous to show video of horses for comparison that are far far from the same starting point and to expect anyone to draw conclusions from it. As it is, sadly this just looks like another pretext for bashing natural horsemanship which is a shame. The BEST animal trainers collaborate to try and learn from each other and some of the best are those combining natural horsemanship thinking with the use of positive reinforcement.. I certainly agree that the horses are at different stages of their training and you are right to notice that! The point of the article was to learn to watch what is being done, though, and to check in with yourself about how comfortable you would be with the same method being used on yourself as a point of reference. Regardless of stage of training, the first two trainers still made a choice to tame and ride the horse all in a few hours. With my mustangs, I take a few months to tame them so they are comfortable with me long before I ride. So, to me, it’s a fair assessment because the horses didn’t need to be stressed – it was the human’s desire to “get the job done” regardless of the horse’s threshold. I think your precautionary notation is well founded. Please understand we are not bashing a method so much as questioning it’s ethic. You’ll have to forgive us, me, for having studied the horse from a perspective that shows us that what is happening is NOT what is being said is happening very much of the time in NH. Words that put our teeth on edge, if others such as myself don’t mind me speaking what I think is their mind, are those such as “trust,” “confidence,” “games,” etc. We look at the horse, and have worked extensively with positive methods, that is positive reinforcement, which is adding something pleasant and desirable, we see the horse is not trusting but defeated, not confident but rather super alert to what this human handling will do next to them, as for games … it’s only a game when the horse willingly, that is of his OWN volition, shows he truly wants to be there. No, not be there because he’s become habituated to the pressure of the handler and knows how to ease it off a bit by compliance, but there because he’s truly curious, playful, listened to. I cannot stress that last one enough. NH horses are not listened to in the sense that their needs in a relationship are honored, just as one would with a friend or other significant partner. “Why are the horses in cages?” One might think that with 25 years of experience as a trainer, coach, instructor that my greatest satisfaction with a student would be as they become advanced. Metaphor of course as I quote it here, but when a student questions why I do something with a horse it makes my heart glad. And reminds me that when I do not have an answer that I must defer to the child and ask the question the child asks. And this in all things related to the horse. Too many of us forget that we believe what we were taught, and see what we were taught to see. I have had to revise my knowledge base repeatedly during that twenty five years and I expect I will continue to to the end. Ask like a child. What more can be said? When did we lose the ability to see things through the horse’s eye as a child can? I wouldn’t like this to turn into “natural horsemanship bashing” either. The bottom line is Monty et al can get a horse from being wild to being a pretty good equine citizen in a very short space of time, in a way which is HUGELY preferable to the old cowboy techniques. So, if you have 50 mustangs and not much time, this is probably the best way to go! Just be honest about it – the horse doesn’t have great fun during this process but if it ends up a “good horse” it wll have a better life. If you have just one or a few horses and plenty of time, you probably don’t want your horse to go through the fear associated with a “quick start”. Clicker training is not a magic wand and like any method can be done well or badly. You can frustrate a horse (ever been frustrated playing the training game?) And you can get into trouble and end up with a very pushy horse if your timing is off. However I think it has the potential to be the most horse-friendly method available to us (not necessarily using a clicker but using operant conditioning, positive reinforcement and a bridging signal. I include SATS in this). I suppose it depends on your priorities and what you want from your relationship with your horse. I found this post at the perfect time. I’ve been thinking about this for some time but had not been able to put into words the problems I was feeling in my training sessions. I had been questioning myself and my boss, and this confirmed what I felt and helped me regain my confidence. Thank you. Late to the party, came this way via Suzanne Clothier’s blog. It’s been about 9 years since I rode (wait, that long? I need to get my life sorted out so I can fix that!). In the first clip, I noticed how one horse repeatedly had the rope thrown at his back legs and he kept kicking. So clearly “I don’t like that, stop it. Stop. Stop. No, I said stop. Stop. Stop.” and the horse never learns to be ok with that, but more stop responding to the stimulus. Also, we teach kids to respect one another when they say stop, and totally ignore animals when they tell us to stop. Also it looked like that horse had some scarring on its back legs, so perhaps it had a bad experience with something back there and needs more gentle understanding and letting it work though it, instead of “deal with it, horse!” Watching those ears flick around, not knowing what crazy stuff the human was going to do next. The second clip, I was really struck by how much the horse wanted to get away. But there was no more away to go. He would have gone into the next county, if that wall weren’t there. And I read all the Monty Roberts stuff when I was a horse mad teenager, I thought that was the way to go. And that last one. I had no idea you could do things that way with a horse. And I’m ashamed the horse has a better auto look than my dog does. 🙂 At one point, I was like “Why doesn’t she get on already?” and then I realized, no, it’s about the horse. She wants him so comfortable with the process it’s almost boring. “Oh, this again. OK, cool, I got it.” Confidence and comfort, instead of throwing new things at the horse and letting it panic and freak out.